Ganden-Sayme is one of the most beautiful and popular trekking destinations in Central Tibet and it takes about 4-5 days to pass through Shuga-la (5250m). 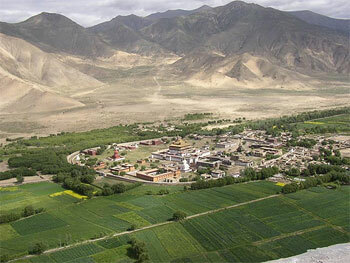 This adventure partly makes very appealing as you would start the trekking from Ganden monastery and end in Yarlung valley where you can visit Samye Monastery and Yumbulhakhang. You will have an opportunity to explore Lhasa while you acclimatize and rest and shop few days after this medium to difficult trekking. In the morning visit Potala, which was originally constructed in 637 by Songtsen Gampo, the first king of the united Tibet, and later expanded and served as the winter residence of the Dalai Lamas as well as the religious-political nexus of traditional Tibet. In the afternoon visit Jokhang temple, the center of the Tibetan Buddhism and the sacred land of Buddhist followers where innumerable pilgrims come for worship everyday. The temple, built in 647, is the earliest wood-and-masonry structure still existing in Tibet. Surrounding the Jokhang Temple is the bustling Barkhor Market place which is the religious and social focus of Lhasa.